After going to Rinnoji, it’s a short walk up a hill to reach Toshogu. Toshogu is the main attraction in Nikko. It is a large, fantastic, complex with intricate designs throughout. 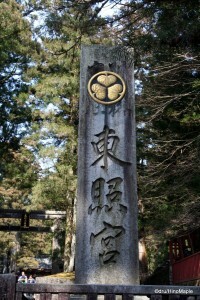 Upon entering the temple grounds, you’ll be greeted by the typical torii gate, but also a large pagoda. Rinnoji is a fairly traditional Japanese temple, simple. Toshogu is the polar opposite. The main pagoda has been likened to Chinese and Korean style temples. Lots of colour and various statues of animals adorn the rafters. This creates a very interesting style where people either love it or hate it. Many people have hated this because it isn’t “Japanese”, but that is a completely different argument altogether. However, upon entering the paid area of Toshogu, you’ll see a huge crowd of people gathering around a plain wooden building. It is very small compared to the surrounding buildings and it looks somewhat out of place. This is the famous Three Wise Monkeys (Hear no evil, Speak no evil, See no evil) building. It is the most famous image of Nikko. Three Wise Monkeys are three monkeys, one covering his ears, one covering his mouth, and one covering his eyes. 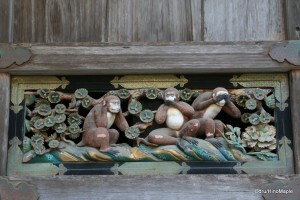 There are other carvings around the building featuring monkeys in other situations, but by far, the Three Wise Monkeys are the most popular. From here, you will see a few black and gold structures along with several carvings of various exotic animals. There are several carvings of peacocks and some of elephants. Unfortunately, the elephants look nothing like an elephant, and several sculptures looked scary. Towards the back of the complex, you will see pretty much the same. There is a second area featuring the mausoleum of Tokugawa Ieyasu, for which Toshogu was built. The cost to enter is expensive, so I never bothered to enter. There is another famous carving of a sleeping cat, but I didn’t feel it was worth the extra 800 Yen. The last place to visit within the shrine is Yakushido Hall. It is a small building which can have lots of people lining up to enter. Within the main room, there is a painting of a dragon on the ceiling. One of the priests/monks will give an explanation about the hall and how banging two sticks of wood in the right place will allow you to hear the dragon’s cry. He will demonstrate that if you away from the centre, the two sticks will sound like normal. However, when he bangs the sticks in the right location within the room, it will echo and resonate to sound like a dragon’s cry. It was a very interesting demonstration, but pictures and video aren’t allowed. After visiting Toshogu, you can head over to Futarasan and Taiyuinbyo. Taiyuinbyo is another mausoleum, but this time it was built for Tokugawa Ieyasu’s grandson. It is smaller in scale, and it isn’t as busy as Toshogu. It isn’t as spectacular, but just as intricate. There are more Shinto gods guarding the area, and it’s location at the base of a mountain makes it very picturesque. I personally enjoyed this shrine more than Toshogu, but I was let down a little as many things were undergoing renovations. 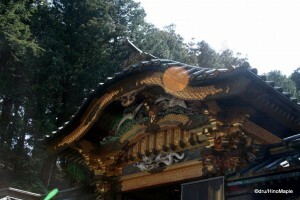 After visiting Toshogu, however, there isn’t much to say about these two shrines. They are typical shrines without anything extremely new or interesting to talk about. I would highly recommend that you rent a car when you go to Nikko. 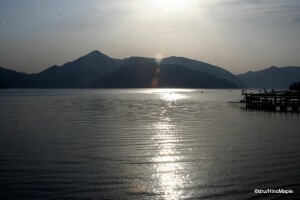 It is the easiest way to get to the distant locations, and you’ll have the freedom to head up to Lake Chuzenji. However, there are buses that head up and down the mountain to Lake Chuzenji, but you’ll be limited to when you can go. The road up to Lake Chuzenji is called Irohazaka. 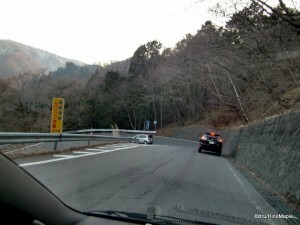 This road is famous among driving enthusiasts and street racers as it was featured in the anime/manga Initial D. The name is derived from the 48 hairpin corners that made up the original road. Iroha is the name of the 48 letters of the Japanese alphabet. Currently, there are two roads going to Lake Chuzenji. Both are one way. One heads up, the other down. Going up this road, there are two lanes. You’ll be able to see a few exotic cars and some motorcycles as they race uphill. Going downhill, there is only one lane, but you’ll see the same cars, only they’ll be going much slower than before. This road is also extremely famous in the autumn season as the leaves turn a bright red, orange, and yellow. It’s not uncommon for this road to be backed up, taking three or four times longer to travel than other season. Lake Chuzenji itself isn’t that spectacular. Near the end of the uphill portion of Irohazaka, you can pay to take the gondola up to a lookout point. From here, you will be given beautiful views of Nikko, Lake Chuzenji, and Kegon Falls. Around the lake, you can do all of the normal things you would do at any lake. Swimming and taking a “swan boat” onto the water is popular. There are also many shops in the area that let you try Nikko’s famous food, tofu “skin”. Beware that during the winter months, most of the shops are closed due to the lack of visitors. 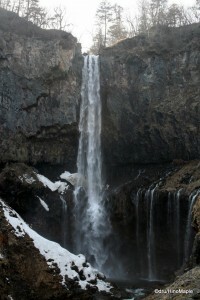 The main attraction would have to be Kengon Falls. Standing at 98 metres tall, this waterfall is one of the tallest in Japan. Taking the elevator to the base of the waterfall is recommended as you may be able to see some Japanese mountain goats and you can have a better view of the falls. Note that in the winter months, it’s extremely cold, so dress warmly. If you decide to spend a day or two in Nikko, hiking around Lake Chuzenji is very famous, and there are various hot springs in the area. Kinugawa is a famous hot spring resort town that is a short drive from Nikko. You may also be able to see a few monkeys running around. Beware that the monkeys can be aggressive, so keep a little distance and be aware of them if they are coming towards you. Note: This is part II of a II part series. Please return to Part I for the first half of this post. This entry was posted in Kanto and tagged Chuzenji, dragon's cry, elephant, Futarasan, hairpin, hairpin corner, Hear no evil, hot spring, Initial D, Iroha, Irohazaka, japan, Kengon, Kengon Falls, Kinugawa, Lake Chuzenji, mausoleum, monkey, Nikko, Nikko-shi, peacock, Rinnoji, See no evil, Shinto, shrine, Speak no evil, swan boat, Taiyuinbyo, temple, Three Wise Monkeys, Tochigi, Tochigi-ken, Tokugawa Ieyasu, Toshogu, Yakushido Hall by Dru. Bookmark the permalink.